Foods laden with added sugar -- sweet cereals, doughnuts, muffins, toaster pastries, pancakes drowned in syrup and cereal bars -- do not make for a healthy breakfast. Make the most important meal of the day a nutritious one that fuels you through the morning with sustained energy from sugar-free whole grains, healthy fats and protein instead. Added sugars in foods add calories to your diet, but have no nutritional value and increase the risk of type 2 diabetes, heart disease and other disorders. Sugar and foods made from refined carbohydrates, such as white bread, sweet cereals, potatoes, white rice and doughnuts, which act like sugar in the body, are digested rapidly, sending your blood sugar level up. Insulin is released by the pancreas to counter the sugar, which causes blood sugar to crash, leaving you irritable, listless and hungry for more sweets. Start your day on a good nutritional note with a healthy breakfast free of added sugar. Have an omelet made with eggs, egg whites or egg substitute and your favorite veggies, along with whole grain toast. 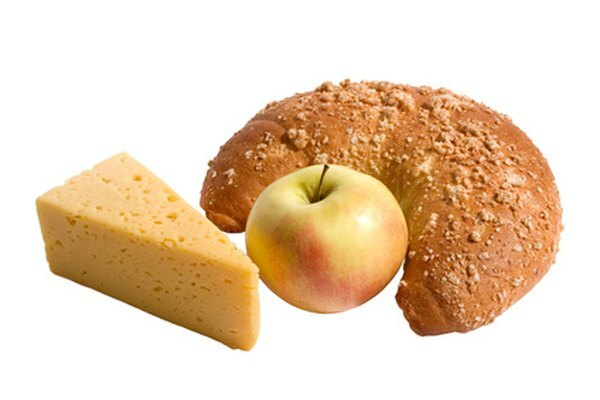 Or try a grilled low-fat cheese sandwich or peanut butter and banana on whole wheat bread. Consider having last night's dinner leftovers, or a bowl of whole-grain oatmeal cooked in skim milk and topped with almonds. Try smoked salmon and low-fat cream cheese on a whole grain bagel, or have fresh or unsweetened frozen berries and nuts mixed with plain low-fat yogurt -- the premixed and fruit-on-the bottom varieties often contain a lot of sugar. A rushed morning doesn't mean you have to grab a doughnut or a sugary snack from the vending machine. Have a few items you can grab as you run out the door like low-fat mozzarella sticks and whole-grain crackers or low-fat cheddar cheese cubes and fresh grapes. Make your own trail mix with almonds, walnuts and your favorite dried fruits; divide it into individual servings and stash them in your desk, car and briefcase. Most American consume 22 teaspoons, or 88 grams, of added sugar every day. To reduce the risk of heart disease and other disorders, the American Heart Association recommends that women limit added sugar intake to 6 teaspoons, or 24 grams. The sugar that occurs naturally in some foods, such as in milk and fruit, is not included in these guidelines. Included are added sugars such as honey, brown sugar and high-fructose corn syrup.